Thank you so much for everyone’s support at the TICOT Brunch. Thank you to the Garage for the wonderful food and great service. This show was hosted by 3 magnificent hosts: HMIM Regent Empress 32 & 27 Teran Blake, HMIH Imperial Crown Prince to Reign 32 Billy Blake and HMIH Imperial Crown Princess to Reign 32 Bekka Blake. Kathy Sparkles and Alan J Dickinson recorded the performances for our social media platforms. Dwayne collected the money raised from the performances. $250 was raised and all of the proceeds will go to the Reign 32 charities: The People With AIDS Foundation Food Programs, Rainbow Railroad and Supporting Our Youth. Thank you! Imperial Crown Prince Billy Blake, HMIH Imperial Crown Princess to Reign 32 Bekka Blake, HMIM Empress 6 & 26 Michelle DuBarry, HMISM Emperor 24 of the Waterfall Empire Daemon Valencia, Brody, Yuki Blossom, Cereza Reina, Davey Diamonds and a surprise duet with Melanie. 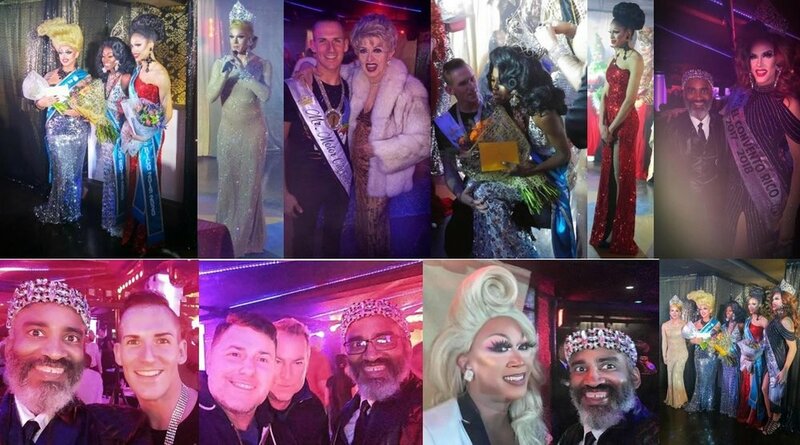 It was a pleasure to see James, Fontaine, Heaven Lee Hytes, Alain and Ross Scorch. Thank you so much to members of the Waterfall Empire for joining us: HMISM Emperor 24 of the Waterfall Empire Daemon Valencia, Brody, Jason and Stacy. Thank you! 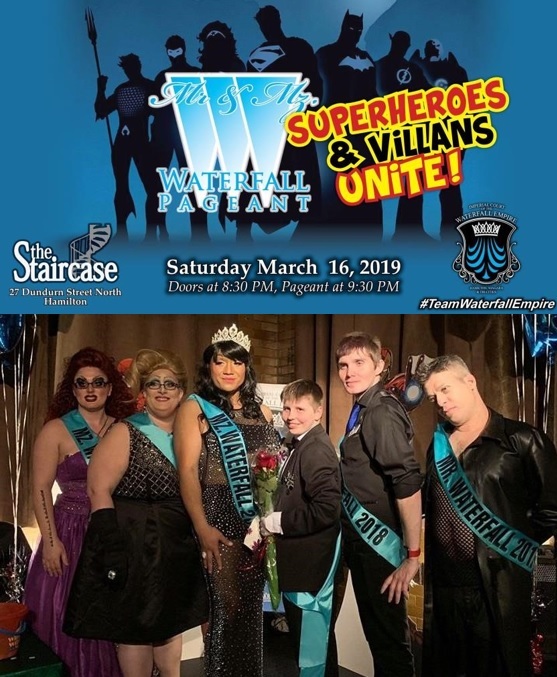 The Imperial Court Of Toronto appreciates your support and is looking forward to seeing the Waterfall Empire on Saturday March 16 at the Staircase Theatre for the step down of Mr. and Mz. Waterfall Empire Ben Stein and Mz Kitty and the crowning of the New Mr. and Mz. Waterfall Empire. The Theme is Superheroes and Villans Unite. To everyone that came out to the TICOT Brunch, your support is greatly appreciated. If you missed this event, don’t worry, we will be back again at the Garage on Church on the 3rd Sunday of the month, 1pm to 3:30pm. March 17 will be a special bunch, A Celebration of Life Of Natalie Rosa Papotto. Family and friends of Nat are invited to enjoy a special edition of the TICOT Brunch in her honour. The TICOT Brunch was her last public event before entering the hospital in January. Those closest to her knew that drag and community fundraising were 2 of Nat’s greatest passions. Before the TICOT Brunch you may want to catch a show over at the Drink, Drag Brunch 12pm-3pm hosted by TICOT Queen Mum 2018 Endora St. Moorehead and Kitten Kaboodle. Get out and support the community. Unfortunately I send my regrets for the upcoming weekend as I will be in BC for the Vancouver Coronation. I look forward to hearing all about it upon my return. Thank you to the ICPs to Reign 32 Billy Blake and Bekka Blake for representing the TICOT Upper house at the Spearhead Anniversary and Black Eagle Kennel Klub’s Puppies Feeding People III events. 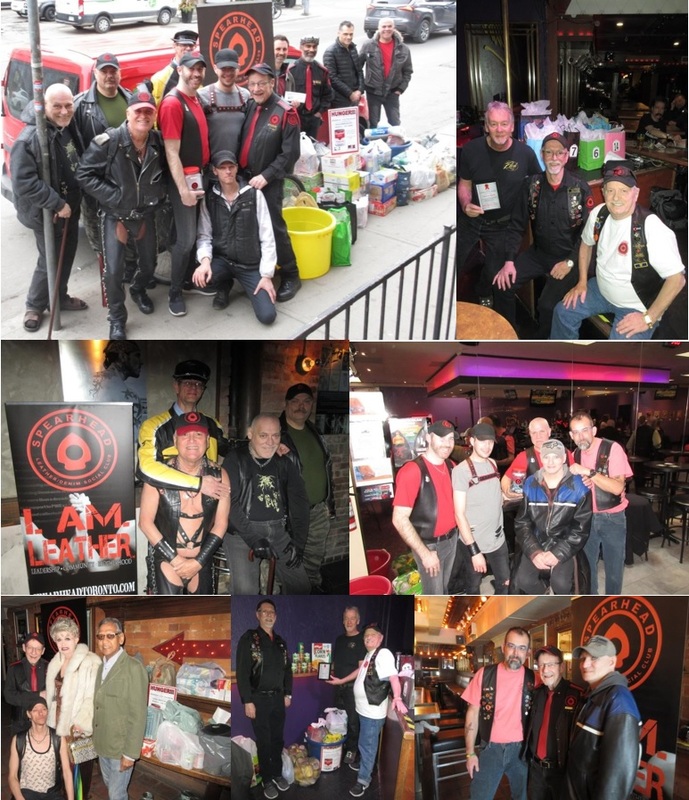 SPEARHEAD Leather Denim Social Club celebrated their 49th Anniversary at Sambucas this weekend. Non-perishable food items, personal grooming items and cash donations were collected at the Black Eagle for the BEKK's Puppies Feeding People III event in support of SPEARHEAD's Easter Food Drive. TICOT was presented a 2019 Appreciation Award at the Anniversary Dinner. Thank you to our brothers at SPEARHEAD for this recognition! You are valued Community Partners and we look forward to continuing the good deeds that our organizations do! Ross and I (HMISM Emperor 32, The Randy Emperor) would like to thank SPEARHEAD Leather Denim Social Club for the honour of receiving these 2019 Appreciation Awards. It is our pleasure to support the work that you do and we congratulate SPEARHEAD on celebrating 49 years of brotherhood! Thank you! The annual Mr. & Mz. Waterfall Empire Ambassador Pageant was produced by the Topaz Trinity Monarchs, Stephany Bice, Miss Drew, & Robin. The theme was Superheroes and Villans Unite and featured the step-down of Mr. Waterfall 2018 Ben Stein & Mz. Waterfall 2018 Miss Kitty. The emcee was the incomparable Empress XXII Dusty Balfour. TICOT was represented with a special guest performance by HMIM Empress 32 &27 Teran Blake, HIM Empress 30 Nikki Chin on the judging panel and HIH Kathy Sparkles as the official photographer of the Waterfall pageant. Congratulations to Mr Waterfall 2019 Brody McMenemy and Mz Waterfall 2019 Joanna! It was a pleasure to attend the 48th Coronation of the Dogwood Monarchy Society, the Mother Court of Canada. Congratulations to Emprex 47 Continental Breakfast and Empress 47 Misty Meadows on a successful reign. All the best to the newly elected Monarchs Emperor 48 Del Stamp and Emprex 48 Alma B Itches. We look forward to seeing what you do during your reign. I really had a great time in Vancouver. So many old and new friends that I had the pleasure of spending time with. Thank you so much for such a wonderful weekend. 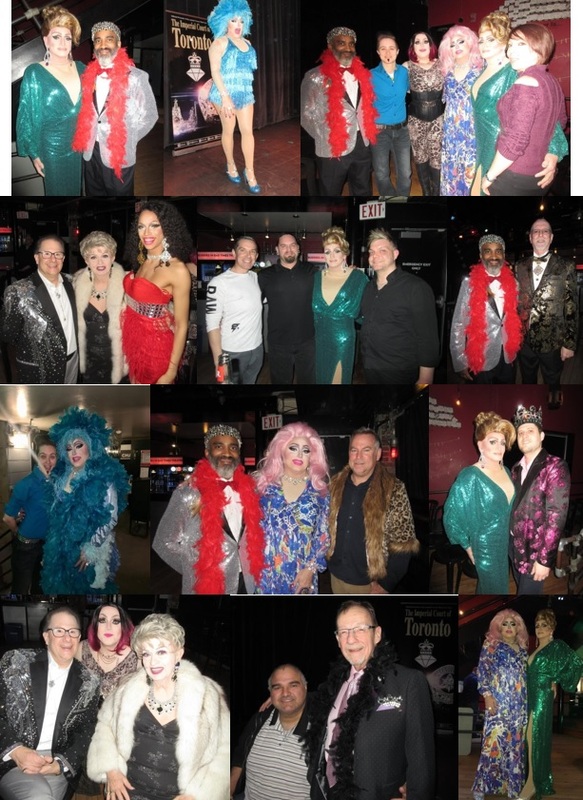 The Imperial Court Of Toronto out and about in support of SPEARHEAD's Annual Easter Food Drive. All of these locations were very generous for this event benefitting the Toronto People With AIDS Foundation: The Black Eagle Toronto, Flash on Church, Woody's/Sailor, Pegasus on Church Thank you everyone for your contributions! Thank you to everyone that came out to TICOT’s Feathers And Furs event at Buddies In Bad Times on Saturday March 23. It was an intimate group of supporters in attendance. Thank you to HMIH Imperial Crown Princess to Reign 32 Bekka Blake, HMIH Imperial Crown Prince to Reign 32 Billy Blake and HIH Kathy Sparkles for taking on this event. Thank you to Buddies In Bad Times for allowing us to grace your stage! Your staff were amazing to work with! A fantastic job by ICPs to Reign 32 Bekka Blake and Billy Blake in hosting the evening’s event. Thank you ICP Billy Blake and Steph for dealing with the music. Thank you to Melanie for looking after the admission door and Dwayne for looking after the money that was raised during the evening. The show featured many fantastic performances: HMISM Emperor 32 - The Randy Emperor and HMIM Empress 32 & 27 Teran Blake, HMISM Emperor 24 of the Waterfall Empire Daemon Valencia, HMIH ICP Billy Blake and HMIH ICP Bekka Blake, Emperor 30 Jason Dickson-Vanderbilt, Empress 6 & 26 Michelle DuBarry, Queen Mum 2018 Endora (James), Kitten Kaboodle, Cereza Reina and Miss Fiercalicious. Thank you to Kathy Sparkles for promoting the event on social media and recording the performances. Thank you also to Alan J Dickinson for also recording the event. Thank you to Ross for taking photos. Thank you also to Emperor 27 Big Kris, Emperor 25 Ron DaMae Bouvier, Kevin Levere, Jim Cooke and Kevin for being there. We had guests from The Imperial Court of the Waterfall Empire of Hamilton, Niagara, and Tri-Cities. Thank you HMISM Emperor 24 Daemon Valencia and I.G.D. 24 Chanelle (Christopher James Janus). Your support is greatly appreciated! Thank you to everyone that donated an item for the raffle draws: Amped Accessories (Fendi), Kathy Sparkles and ICP Bekka Blake. Thank you to Melanie and Alan for looking after the raffle ticket sales. Congratulations to all of the winners. Feathers And Furs raised $500+ for our charities of choice: Rainbow Railroad, The Toronto People With AIDS Foundation Food Access Programs and Supporting Our Youth. On behalf of the Upper House of Reign 32, thank you all for making this event a great success! We very much appreciate each and every one of you for coming out and supporting The Randy House Of B.L.A.K.E. On behalf of the Upper House of Reign 32 and the Imperial Court of Toronto we would like to congratulate ICPs to Reign 9 of RISCLSWO Ajay Voutour and Icp Janet Daniels on a successful Leather and Lace Masquerade ICP Ball. It was a pleasure to take part in the festivities and see our London and Waterfall Empire family. Thank you to Melanie for making it possible for the Reign 32 Upper House (HMIM Empress 32 & 27 Teran Blake, HMIH ICP to Reign 32 Billy Blake and HMIH ICP to Reign 32 Bekka Blake)to attend. Two of the Reign 32 Halves (Canadian 1/2 Emperor Rhyan Stone and Canadian 1/2 Empress Miss Drew) were there as well. Thank you again to RISCLSWO for all of your hospitality! Photos by HMISM Emperor 32, The Randy Emperor and HMIM Empress 32 & 27 Teran Blake. TICOT’s Drag BINGO was hosted by HIM Empress 31 & 29 Morgan James and special guest caller ICP to Reign 32 Bekka Blake. Thank you to Flash on Church and Sid for all of your support. Thank you to everyone that contributed to the raffle prizes and the raffle tickets were handled by Kathy Cougar and Empress Morgan James. Congratulations to all of the winners. Thank you to everyone that came out including: Empress 32 & 27 Teran Blake, Emperor 31, 29 and 22 Hunter James, Emperor 30 Jason Dickson-Vanderbilt, Empress 26 & 6 Michelle DuBarry, Emperor 25 Ron DaMae Bouvier, Empress 23 Thelma Bouvier, Empress 11 Rose, ICP to Reign 32 Billy Blake, George Palmer, Dwayne A Moore, David Van Tonder, Alan J Dickinson, Melanie, Kevin Levere and Ross Scorch. 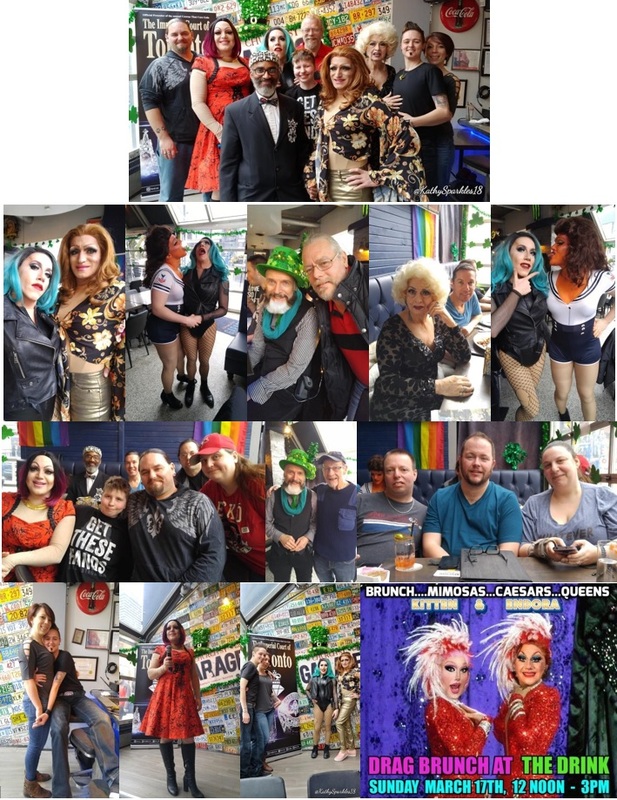 $640 was raised at the TICOT Drag BINGO for the TICOT Reign 32 Charities of Choice: Rainbow Railroad, The Toronto People With AIDS Foundation and Supporting Our Youth. Remember to get your Queen Mum 2018 Endora's fundraiser pins (Canada 50) for $5 each before they are sold out. Thank you for everyone’s support, it wouldn’t be possible without all of you. Photo by Ross. Congratulations to Miss El Convento Rico 2018-2019 Jezebel Bardot on a phenomenal year. Congrats also to the newly crowned Miss El Convento Rico 2019-2020 Naomi Leone, 1st Runner Up Fiercalious (Paulo Fortes), 2nd Runner Up Pepper Maché and Miss Congeniality Dex-ter on your acheivements! It was a fantastic pageant with amazing contestants and hosted by Sofonda Cox.